/ Best Taco in Destin FL / Landshark’s TACO TUESDAY AUBURN vs OLE MISS! TACOS, MARGARITAS & CORONA SpecialS & ROCK’N BINGO at 7PM! 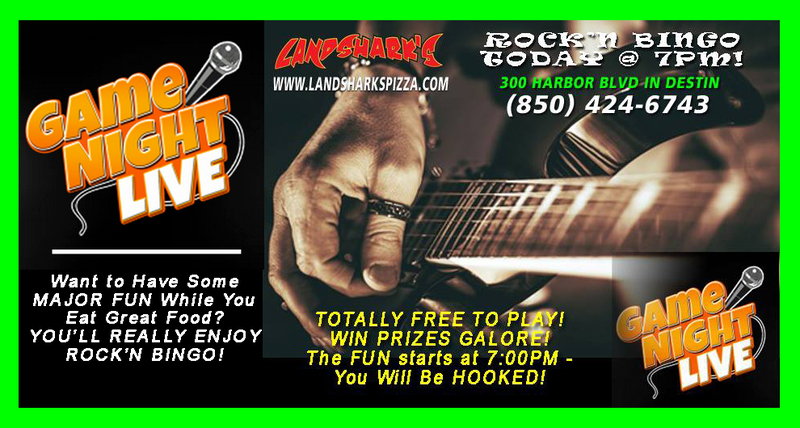 The good times that sleep on Monday in Destin wake up with a vengeance on Tuesdays with ROCK’N BINGO at Landshark’s Pizza! 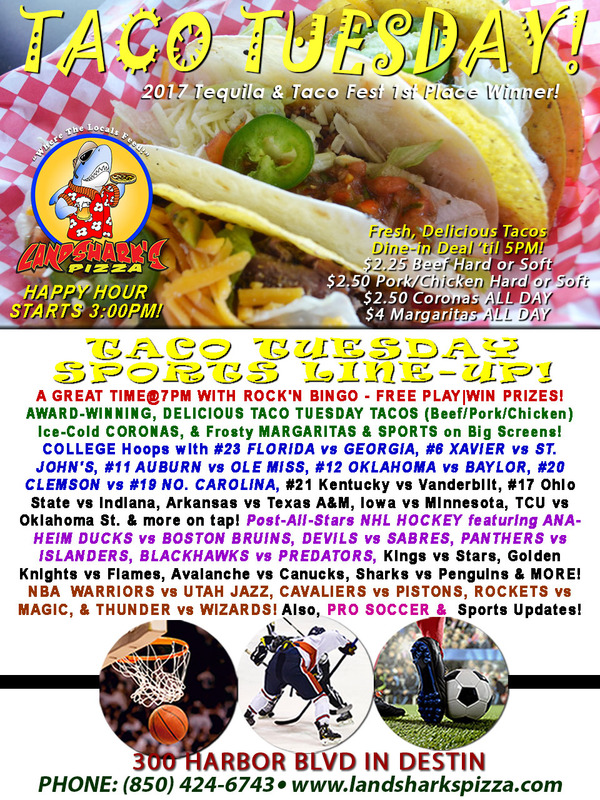 Get your groove going with TACO TUESDAY here at Landshark’s Pizza highlighted by ROCK’N BINGO, NCAA Basketball, NHL, NBA & other sports action here at Landshark’s, your sports fest Taco Tuesday headquarters with Taco & Drink specials! HOT DIGGITY DAWG-LEVEL FUN@7:00PM playing ROCK’N BINGO! 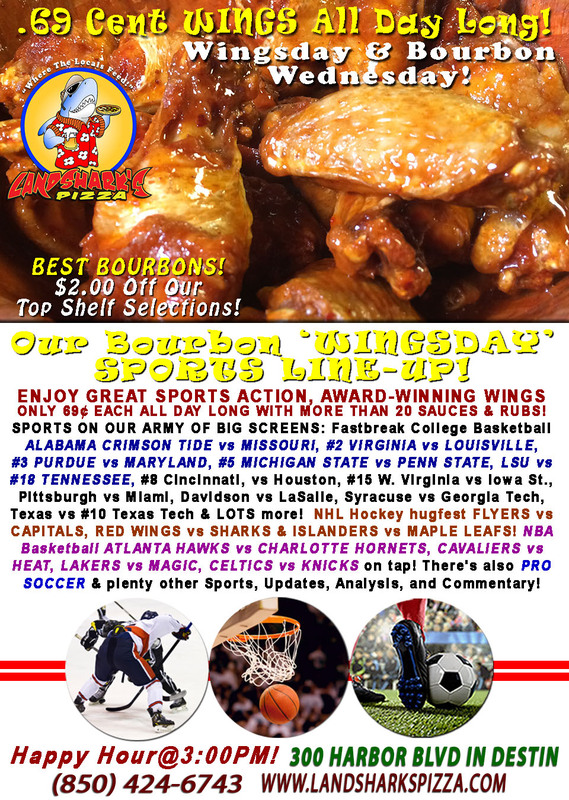 HOT SPORTS ON OUR ARMY OF BIG SCREENS – Post-All-Stars NHL HOCKEY featuring ANAHEIM DUCKS vs BOSTON BRUINS, DEVILS vs SABRES, PANTHERS vs ISLANDERS, BLACKHAWKS vs PREDATORS, Kings vs Stars, Golden Knights vs Flames, Avalanche vs Canucks, Sharks vs Penguins & MORE! College Hoops action #23 FLORIDA vs GEORGIA, #6 XAVIER vs ST. JOHN’S, #11 AUBURN vs OLE MISS, #12 OKLAHOMA vs BAYLOR, #20 CLEMSON vs #19 No. Carolina, #21 Kentucky vs Vanderbilt, #17 Ohio State vs Indiana, Arkansas vs Texas A&M, Iowa vs Minnesota, TCU vs Oklahoma St. & more on tap! NBA Blazing Hot GOLDEN STATE WARRIORS vs UTAH JAZZ, CAVALIERS vs PISTONS, ROCKETS vs MAGIC, & THUNDER vs WIZARDS on a B-ball buffet! Plus PRO SOCCER coverage and plenty other Sports Broadcasts, Updates, Analysis, and Commentary! Previous Post: « Landshark’s DELIVERY Starts Saturday Feb 3rd SUPERBOWL WEEKEND – CALL PICK-UPS NOW!